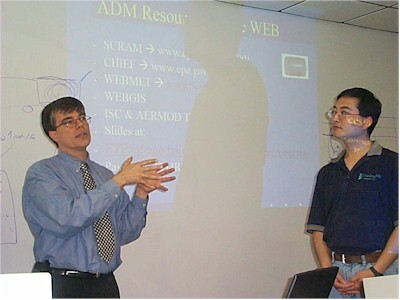 The guy on the left is the teacher for the class I've been taking for the past two days. He has a doctorate in computational fluid mechanics. It's a class in air dispersion modeling: the science of using computer models to predict ground-level concentrations that result from an air pollution source (e.g., a smokestack). Inputs to the models include stack height and diameter, gas temperature and flow rate, chemical concentrations, geographical terrain information, and all sorts of meteorological data. The guy on the right is one of my fellow students. He works for another enviornmental consulting firm. Turns out his boss is the same person who hired me at SAIC twelve years ago. Small world.